I don't know how many years this has been like this but it sure caught my eye and camera. 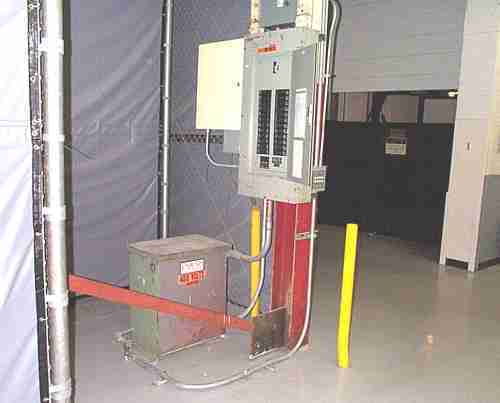 It also might catch some one's foot or their leg trying to get out of the front of the panel if they got shocked or just accessing the panel for work or to reset a breaker. I am going to try and get it rectified and rerouted correctly, I don't know how or why the brace was put there but I'm sure both were installed after the panel. We have a city inspector and permit process supposedly. Maybe the structural inspector doesn't know the Electrical Code? In addition to removing the brace, could you relocate the conduit in front of the panel/ strut on floor so it runs around the other side of the xfrmr, out of workspace? The brace certainly isn't the only prob. here You've got a mess on your hands, what about the secondary(?I think) out of the xfrmr?? ?